In Missouri we kick off the spring turkey season with a two-day youth hunt. In my opinion there is no better way to start off a hunting season. Hunting is a tradition and pastime that not only boosts the economy, but also connects people to their roots. A Reconyx camera caught this big tom strutting in front of a Redneck blind earlier this week. The Growing Deer Team is very serious about youth season, so how do we prepare for it? We start by placing all of our Reconyx trail cameras over food plots and setting them to time lapse. In time lapse mode the camera will take a picture every fifteen minutes throughout the day (depending on the settings). Also, we can see critters that may be too far to trip the motion sensor on the camera. 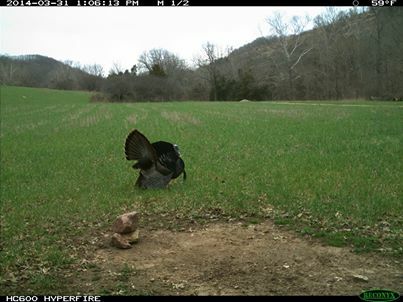 The time lapse images reveal when and where turkeys are entering the field. Once we know where the turkeys are entering the field we can place blinds that put Raleigh and Rae in position to harvest an elusive Eastern Turkey. We put a lot of work into scouting for youth season because we want the hunt to be enjoyable. If a youth hunt is enjoyable, regardless of a harvest, I consider it a success. The goal is to pass on the tradition of the hunt, a kill is secondary. The team will be out this week listening for gobbles and positioning blinds. I hope you have a chance to put some time into scouting for the upcoming youth hunt. Make it fun, pass on the tradition, and give thanks to the Creator who made it all possible.